Intriguing, exciting original compositions by Attila Fias, along with inspired interpretations of Hungarian folk songs and music by Béla Bartók. 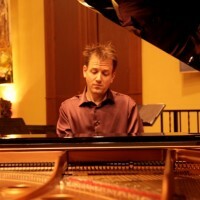 Attila Fias is an award-winning, Hungarian born jazz pianist, composer and arranger based in Toronto. He is a versatile musician, whose playing has been called pyrotechnic, stunning, playful and sophisticated by the Toronto Star, Wholenote magazine and Exclaim magazine. His special blend of sounds from across the globe reflects his rich and varied musical background with influences from Hungary, Brazil, Cuba and India. Attila’s experience includes performing and recording with notable international musicians such as Oscar-winning Indian superstar A.R. Rahman (Slumdog Millionaire), world-renowned tabla master Zakir Hussain, and New York harmonica virtuoso Hendrik Meurkens, in venues such as Madison Square Garden, Sydney Superdome and Wembley Stadium. The Attila Fias Quartet was the main performers at the 61st Primetime Emmy Awards Governor’s Ball in Los Angeles. With over 100 different internationally distributed albums to his credit, Attila has several gold and platinum records, and has recorded three albums of his original material. His latest album called “Ride” will be released in October 2016. He will be joined by virtuoso bassist Scott Kemp and multifaceted drummer Richard Brisco.